William Horace de Vere Cole's pranks are legendary. 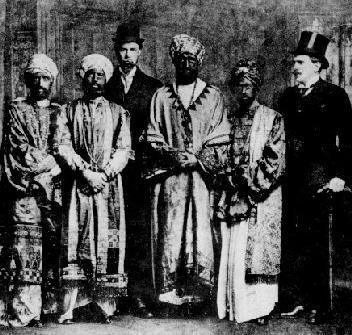 The most well-known is probably the Dreadnought hoax of 1910, in which Cole and five friends (including a young Virginia Woolf) disguised themselves as the Emperor of Abyssinia and his posse, and were given a full VIP tour of the British warship, the H.M.S. Dreadnought. The proud members of the British Navy came out in full colours to receive their distinguished guests, who were dressed in costumes, with dyed skin and hair, and speaking a language they were inventing on-the-fly. The hoax is sometimes referred to as the “Bunga-Bunga Affair” — a reference to this invented Abyssinian dialect the hoaxers used while on the ship. Cole may have been in training for his Dreadnought coup when, as a student at Cambridge, he impersonated the Sultan of Zanzibar, and was wined and dined along with his entourage (other Cambridge students) by the high mucky-mucks of the area. The hoax was revealed when it was discovered that the real Sultan had been in London at the time, but Cole and his gang kept quiet until they’d left college. Cole once targeted a Member of the British Parliament thusly: he slipped his own gold watch into the M.P.’s pocket, then somehow convinced the man to join him in a brief footrace down the street. At some point, Cole began yelling “Stop! Thief!” The baffled M.P. was caught, red-handed, and (despite Cole eventually fessing up) arrested. Cole is an also-ran on the list of possible suspects behind the Piltdown Man hoax as well. Cole would occasionally impersonate prime minister and Labor party leader Ramsay MacDonald, giving speeches that contradicted MacDonald’s actual political views. The Abyssinian delegation; Cole is at the far right of the photo.